The course provides the right blend of academic discipline and actual journalism coverage, with its own TV channel to broadcast your work; all in the very affordable, comfortable, easily accessible, and fun setting of one of Britain’s oldest and most interesting cities. Temitope's short film, Almajiri is Begging, scooped up the Student award in the 2016 Amnesty Media Awards. In addition to working as a freelance filmmaker focusing on issues affecting women and children in Africa, she is also currently running two-hour after-school classes every weekday to educate Almajiri children in her hometown, Yola, Adamawa, where she filmed her award-winning documentary. 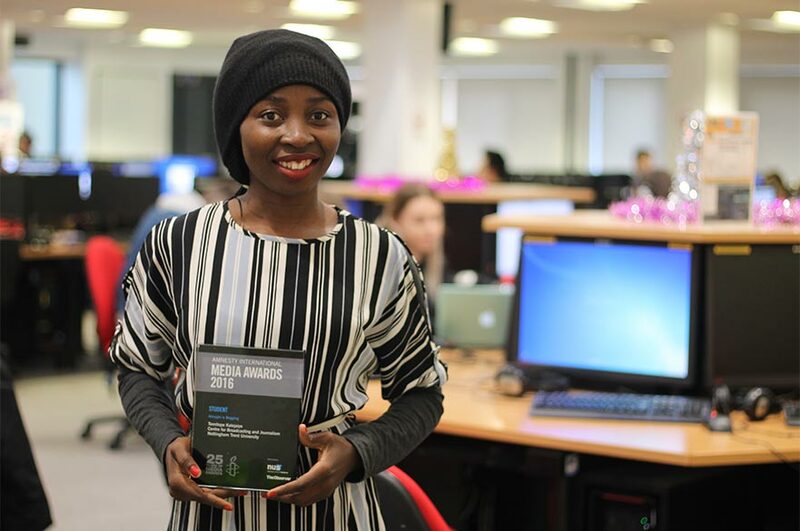 “I really appreciated the facilities, including the library, lecture theatres, and the newsroom and studio set-up. I found the academics extremely approachable, positive, helpful and supportive; without exception. "Since graduating, I've worked at The Guardian newspaper and undertaken assignments for them and other media outlets in north-eastern Nigeria, but I am currently working as an Assistant Communications Officer at the Commonwealth Secretariat. ComSec, as it is known, is the administrative arm for the whole of the Commonwealth, which consists of 53-member countries and 2.4 billion people. "As part of the communications team, my role is to raise the profile of the Commonwealth in addition to increasing the Secretariat’s visibility on social media and our website. The invaluable training I received at NTU means I can do these tasks with confidence. Every day I write news stories and create short videos, all skills I was taught by my tutors at NTU. "I am so grateful to my tutors for helping me to become a journalist because I have transferred those same skills to media and public relations. This grounding helps me to understand what newspapers and broadcasters want so that I can tailor a story to suit different outlets." "I was thrown in at the deep end when I started because I joined two days before the biennial Commonwealth Heads of Government Meeting or CHOGM. It was held in London and the last time it was in the UK was 20 years ago. During that week, I was so lucky to see and hear world leaders, and of course Prince Harry and his bride-to-be. I am in the privileged position of being in the room when history is being made." "I ended up writing a short article for the Commonwealth website to congratulate the now Duke and Duchess of Sussex. It was such an honour. So far, this is the article where I’ve received the most feedback. I received so many calls from friends and family in Nigeria." “I would highly recommend NTU and the MA Broadcast Journalism course; it has consistently and justifiably been recognised as one of the top media courses in the UK. The course is an excellent introduction to the world of journalism, and equips you with the skills needed to gain a foothold in the industry. “Since returning from the US, I have started two-hour after-school classes every weekday to educate Almajiri children in my hometown, Yola, Adamawa, where I filmed my documentary Almajiri is begging. “As well as learning, the boys also receive a nutritious evening meal. During my Mandela Washington fellowship in the US at the presidential precinct in Virginia, I was able to get a partnership with WAGILABS. It’s a curriculum that teaches children how to be creative; finding innovative ways to solve problems in their community.